The weekend we’ve all been waiting for has finally arrived! That’s right, folks! 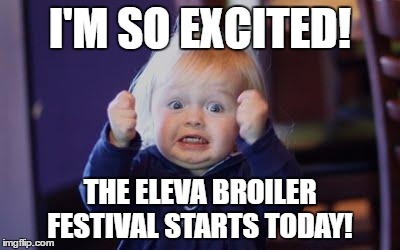 The 58th Annual Eleva Broiler Festival kicks off in just a few hours! Keep up to date on any event changes via our website and our Facebook page, although we’re hoping the rain misses us! Tag us in your pictures as well! And most importantly, have fun and be safe! Let’s do this!